What a night it was! 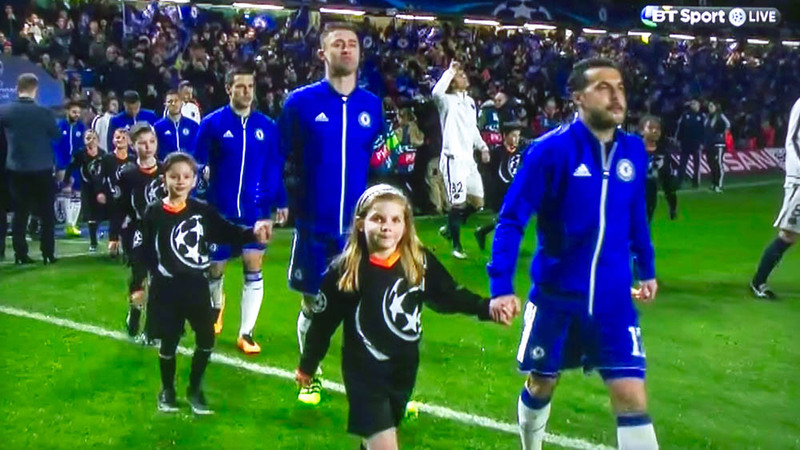 Our granddaughter Eira was chosen to be one of the player escorts at the UEFA Champion’s League match at Stamford Bridge in West London between Chelsea and Paris St Germain. As devoted grandparents (if not Chelsea supporters) we sat in front of the television eager to catch sight of our wee Eira. And there she was, walking hand in hand with Chelsea’s No 17, Pedro. That was the most exciting part of the match: Chelsea were outclassed and defeated. I recorded the programme and experimented with taking a photograph of the television screen. I remember in the old black and white television days that you would regularly get a broad black band in such photographs, as the television picture scanned. But there was no such problem on this occasion. The photograph is not of a wonderful quality. but it will be a good permanent record of that night to remember.